If you were literally joined to someone else for life, how well would you cope? Joined together from the shoulders downward, each of the girls has their own upper torso – head, heart, lungs, stomach, spine – but have only one arm each, and share the same lower body: Abby controls the right side – right arm, right leg – and Brittany the left. Which means that everything they do – everything – is an ongoing exercise in extreme cooperation. To give some idea of how extreme that cooperation must be, cast your memory back to that old staple of primary-school sports-days, the three-legged race. You’d hold each other round the waist or shoulders, perhaps, and have your side-by-side legs tied together, and you’d then both try to run like that, one-and-two, one-and-two. Except that in their case this is just two legs, alternately, as in a normal gait – which is a hugely harder challenge, especially as each can only sense directly her own side of the body. At first glance, just about everything we see in the documentary seems normal enough: they walk, run, dance, swim, study, ride a bike, type emails, go water-skiing, play a piano, drive a car (fast! ), text two-handed on a cell-phone, do their makeup, play tourist, ride a Segway, brush their hair, enjoy cooking, learn how to row in a four-seat scull, play netball (well enough to beat the boys on the opposing team! ), and much more. Watching them do all of this, it’s very easy to forget that this isn’t just one girl – and very definitely not ‘one girl with two heads’ – but two distinctly different girls who can only do any of this at all by working very closely together in everything that they do. What’s also notable is that although they’re identical-twins, they have distinctly different personalities and tastes: Abby is more interested in maths, Brittany more in the arts; Abby likes bright clothes, Brittany quieter ones; Brittany likes to go out, whilst Abby is more of a ‘homebody’; Brittany likes to try new and different foods, Abby doesn’t. Which means that the same extreme cooperation applies not just to every action, but to every choice as well: everything has to be a workable compromise that’s fair to both, otherwise nothing would or could get done. They’ve started work now as primary-school teachers, working mostly with fourth-grade (8-10yr-olds), apparently doing very well indeed. And I can only wish them luck: I certainly have deep respect and admiration for their emotional and spiritual strength, fortitude, courage. Yet in a sense, their (to most of us) strange life is perhaps the most powerful metaphor and image of how all of us actually live – whether we know it or not. In most cultures – particularly in so-called ‘developed’ nations – we tend to view ourselves as separate, each with our own choices, independent from all others, and free to do as we wish. 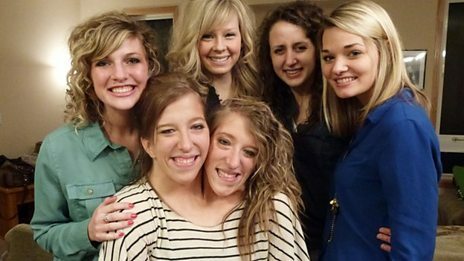 But in reality we too – all of us – are conjoined with each other, no less at all than are Abby and Brittany: we each share the same planet with everyone else. Ultimately, to make it work, we each need to learn that same level of extreme-cooperation, each managing our own specific part of this shared body, whilst also respecting each others’ temperaments, desires and needs. Watching that documentary, and seeing how the girls constantly seek out new challenges, another even greater challenge comes to mind. Because if ever they tire of primary teaching, perhaps they could take up a much broader teaching-role: helping all of us learn how to emulate their skills in extreme cooperation? Yes – Seen this video set down under too. They could have been bitter and twisted by their condition but have made do and grown beyond the norm as people by embracing and revelling in what they actually have. Married to identical twins I see some of what they have in my own family but of course after being together we go home to our separate homes. I’m likely the millionth person to have been inspired by them too.